Over the years we have seen many emerging manufacturing technologies fail, but one has caught the eyes of many and has shown great promise. 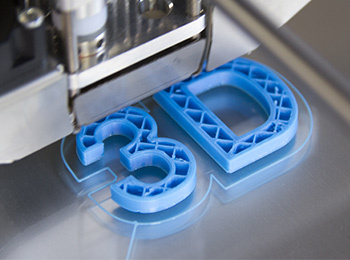 3D printing has developed significantly in recent years allowing individuals and businesses to use the technology. 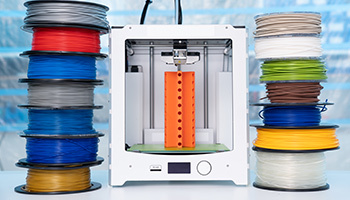 3D printing is not only for printing small trinkets and test models, but the rise in 3D printing has also seen manufacturers start to explore how the process can be used to improve or even replace their current development and manufacturing processes. 3D printing, also known as additive manufacturing, is the process of making three dimensional solid objects from a digital CAD file. The part is made up of multiple layers of material laid on top of each other to create the 3D object. These individual layers are known as slices, these slices show a thin cross-section of the model. 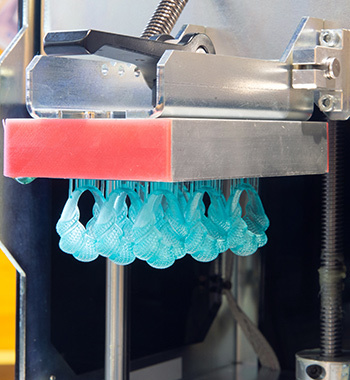 Additive manufacturing as several significant advantages over other methods like subtractive manufacturing and injection moulding as the part can include complex shapes, not easily achievable by other means. Plus the elements can consist of working mechanisms and movable parts without the need for assembly afterwards. The process of making a part with 3D printing is simple. You need a CAD model that is suitably designed for the procedure. This model is then sliced using an application called a slicer. The slicer takes the file and slices the model into each individual layer. The slicer may also create the machine language, such as GCODE, which tells the machine what mechanical movements should be made to produce the layer. The slicer combines all of these layers into a single file which is then sent to the printer. Once the printer is ready, the machine starts to create each part, layer by layer. Depending on the technology used there are different ways in which the layers are formed. Once the printer has completed all the layers, the part can then be taken through a post-processing stage. There are many different styles of 3D printers and technologies that are actively being developed and used by manufacturers. FDM technology is currently the most familiar way of making parts. Printers are built from a simple frame and motion carriage which moves a heated nozzle, known as the hot-end, around, and an extruder pushes a filament, usually plastic, through the hot-end. FDM printers typically come in two forms, cartesian and delta. Cartesian systems are more popular and comprise of three axes, X, Y and Z. Delta printers also have three axes, but they all follow the same orientation. Delta printers allow for faster speeds and are usually used for high models due to the stability of the machine which cartesian machines are used for smaller parts or parts with a large footprint as the device moves the build surface typically. 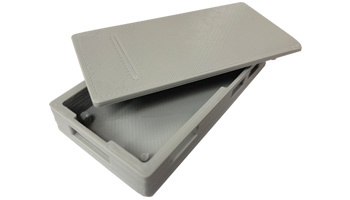 Parts produced by FDM printers have noticeable layers where the plastic has been laid down. The components can be used as a visual prototype but are not recommended for functional testing due to the reduced material strength caused by the layers. 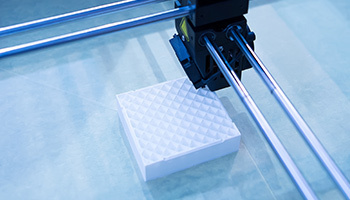 Stereolithography or SLA printers use a resin-based material and use a process known as photopolymerization, a method in which light causes the resin to cure into a solid object. SLA was first developed during the 1980s as a process for rapidly developing prototypes. The technology was protected by a patent for many years, and once it expired, manufacturers started to build their own machines use the process opening up the possibilities. SLA printers cure the resin in a vat using a lowered build plate and a laser, usually ultraviolet, by moving the laser and build plate along with switch the laser on and off rapidly to create the layer. SLA printers frequently print with thinner layers as low as 0.01mm which allows the print layers to blend in and not become visible. As layers are built up, they cure and lock into each other allowing for a stronger part than FDM prints. SLA parts are frequently used as visual prototypes and on occasions used as functional prototypes. 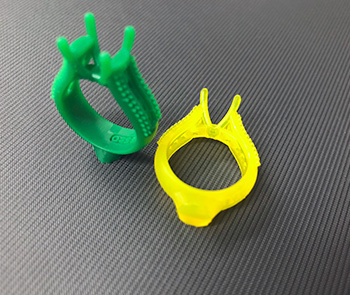 Pieces printed with SLA printers typically are smaller due to the cost involved in their production, the resins are more expensive than other measures, and the process takes considerably longer. 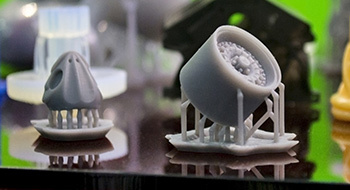 SLS, selective laser sintering printers use a fine powder combined with a heated build chamber and laser to create parts suspended in a block of powder, known as the cake. Selective laser sintering machines typically print using nylon based materials in a small particle powder. However, there are more materials available such as metal filled powders and rubber-like materials. SLS machines work by moving the powder into a build chamber and levelling the build material, the material is heated to near melting point, and then a laser carefully sinters the layer's shape into the powder. This process is read until the full part/build volume is complete. As the prints are held within the powder, it allows models to be stacked very closely. This allows the operator to print large volumes of models in one go without the need for support material or multiple runs. This method is most commonly used in low-volume manufacturing. Completed SLS parts do not show the individual layers but have a slight fuzz on the outside skin. The pieces need very little post-processing but can quickly be died, polished and painted, making them ideal for visual prototypes, functional prototypes and even low-volume products. 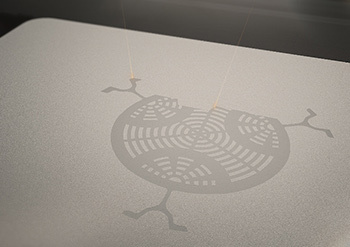 Selective laser melting works in a similar way to SLS printers. However, rather than sintering the powder it melts the powder which creates the layer. SLM is typically used with metal powders like steel and titanium to develop high-strength parts without the cost of CNC milling. Swedish car manufacturer, Koenigsegg, used SLM technology along with a titanium powder to create the exhaust for their One:1 car. The part included intricate details that were not achievable with any other process. Combined with the speed, Koenigsegg developed the exhaust and other components quicker than previously achieved and with less waste. 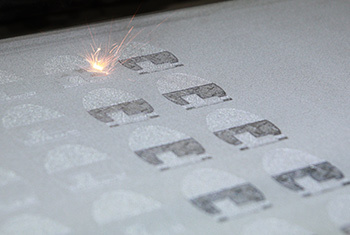 Selective laser melting allows for high quality finished parts and prototypes to be developed quickly with less cost and waste. The finished models do require some post-processing. While there are many more different technologies being used in additive manufacturing FDM, SLS, SLA and SLM are the most common methods being adopted by manufacturers currently. There are other technologies like DLP (Digital Light Processing), PolyJet and Binder Jetting. While the technology has been developing rapidly in recent years, there has also been quick developments in materials used to create parts. Materials can vary in their strength, finish, colour and properties. Polylactic acid, PLA, is commonly used with FDM printers and comes in a filament or pellet form. Polylactic acid is a vegetable-based plastic which usually uses corn starch as the base material. PLA is a fully biodegradable thermoplastic polymer. The plastic is known for being brittle but easier to print with and typically cheaper than other materials. When PLA is heated in the hot-end, it does not give off toxic fumes like other plastics. Biodegradable, the plastic is made from natural materials and readily decomposes over time. More straightforward to print, due to the lower printing temperature of PLA (185-220°C) and with no requirement for a heated build plate or chamber allows the material to bind to the surface. Brittle, PLA is known for breaking easily and shattering rather than bending first like other materials. Manufacturing. PLA requires ample supplies of cornstarch which is typically used in food production. ABS is the most used plastic commercially. It is most well known for being the base material LEGO® bricks are made from and is also the most common material used in injection modelling. 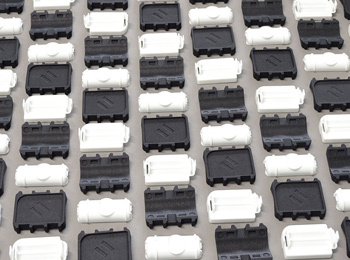 ABS is also most commonly found in a filament or pellet form and utilised within FDM printers. ABS has also become the base plastic for many other printing materials in processes where molten plastic cannot be used. Strength, ABS is a durable plastic which bends before it breaks, unlike ABS which shatters. More readily available. ABS is the most common plastic in use at the moment, resulting in greater access to filaments and pellets for production. Production material. ABS is made from crude oil which means the plastic is not good for the environment and does not decompose very well. Fumes, amongst enthusiasts it is widely known that ABS produces potentially toxic fumes when heated, requiring users and machines to use filters to remove toxic pollutants from the air. Nylon is mostly known for its use within clothing. However, it is a synthetic polymer which is commonly used in functional prototypes. Nylon comes in multiple forms, typically it comes in filament, pellet and powder forms. 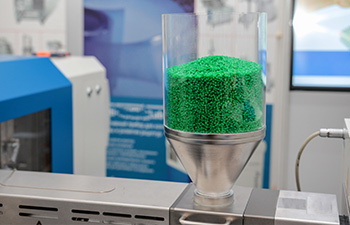 Nylon filament and pellets are used within FDM machines, and the powder is the most common material in SLS machines. Tough, Nylon is a highly durable polymer which bonds incredibly well. Inexpensive, Nylon powders, pellets and filament are very cheap due to the wide availability of the material in other industries. Printing Temperature, Nylon requires high temperatures when printing due to the high melting point, the SLS process utilises a heated chamber along with a laser to sinter the nylon powder, while FDM machines will print nylon with a hotter hot-end (240-260°C). Metal is one of the most common materials on earth. In recent years companies have been developing technologies and materials to be easily printed using additive manufacturing processes. 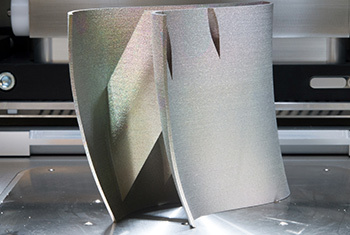 Steel and titanium are the most widely used metals in 3D printing. The materials come in the form of a powder and through the process of selective laser melting the powder the printer builds the object layer by layer while being suspended in the remaining material. These materials are used within automotive, aerospace and marine applications. Strength, metals can offer incredible durability. While the parts are not as strong as forged metal parts, but through an infusion process, the piece can be infused with other metals allowing for the component to increase in strength. Cost, metal printing can be prohibitive due to the value of the material, the printers and the energy required to print the components. In recent years manufacturers of materials and machines have been developing new materials and processes. One important material has been the rise of carbon fibre. Carbon fibre has been used in high-strength, light-weight components for many years. 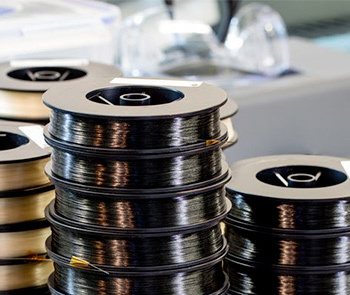 Carbon fibre printing materials come in a varied range of forms such as filaments, pellets, powder and strands. Carbon fibre can be printed using a filament where micro-fibres of carbon as mixed with a base material like nylon, ABS or PLA. It has also been blended with nylon based powders for use in SLS and SLM printers. 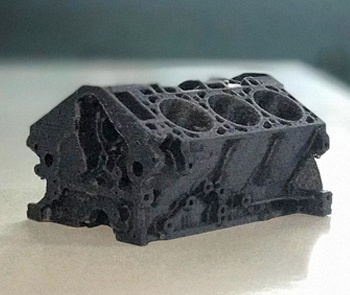 Markforged, a printer and material manufacturer, has developed a machine which can print most common 3D printer filaments and using a second print head lays down strands of carbon fibres in part allowing the part to be stronger in areas where strength is required. Strength & flexibility, carbon fibre allows for high strength but flexible parts allowing for the finished models to be used as functional prototypes. Weight, carbon fibres and carbon fibre plastics allow for light-weight components to be tested. Expensive. Carbon fibre materials typically use costly materials which are complicated to make. The machines used to print carbon fibre materials also command larger price tags due to the techniques being used and the destructive nature of carbon fibre infused filaments. 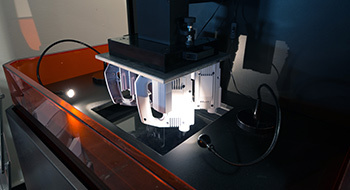 Photopolymer resins are using within SLA and DLP machines. These resins cure with light, typically ultraviolet. The resin comes in a viscous form that is placed in a vat then cured by a light source such as a laser or DLP projector. High detail, due to the processes involved, resin-based prints typically have higher detail and lower layer heights. Mess. When using resin to print you will find that the resin can be messy and sticks to the completed part, this results in the need for a multi-stage post-processing process to clean the piece and carefully dispose of the waste resin. Wax materials are typically used when casting is involved like jewellery manufacturers. There are many different types of wax materials available in many forms. Can easily be cast and does not leave residue when cast. Fragile. Wax models can be very delicate depending on the type of wax used. Many materials are being developed and manufactured. With more materials coming to market we will see more opportunities for brands to incorporate 3D printing into their processes. 3D printing has been used a for many years by many manufacturers due to its reduction in costs and time over other prototyping and manufacturing processes. 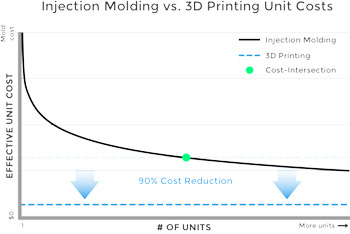 With 3D printing, technology businesses have seen significant declines in the time to develop prototypes as with 3D printing it allows rapid development and iteration of parts with lower costs. Many large brands and manufacturers are starting to adopt this method of prototyping. 3D printing has also been used in low volume production runs. The technology allows for small parts to be produced quicker within short runs and a lower cost as tooling of moulds is not required. 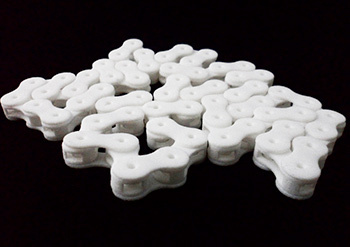 The UK based 3D printing service, 3DPrintUK, worked with Suss My Bike to run a low-volume production of their product. The parts were printed using SLS Nylon and were finished with their dying and polishing processes to produce a low-volume run of their product without the costs for tooling and machine operation. You can find out more about Suss My Bike's product and the process over on 3DPrintUK's website. 3DPrintUK also have worked with a brush manufacturer to develop and print custom jigs for use in their manufacturing process. This use of 3D printing allowed the business to rapidly build their jigs for their machines without the added costs and potential downtime. The parts were printed using SLS Nylon and were explicitly designed for use within the machines developed by the manufacturer. As we have seen, there are a variety of different printers, materials and processes involved in manufacturing, but the industry is only just starting with 3D printing. 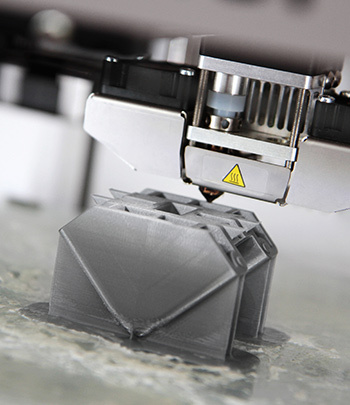 In 2015, the ISO/ASTM 52900 standard was formed to standardise the additive manufacturing process. This recognition of the technology has spurred developments and investment from many businesses and enterprises in the technology. 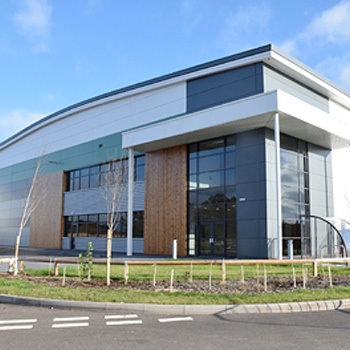 Siemens recently announced that they have invested €30 million in state-of-the-art 3D printing factory in Worcester. This investment shows that large enterprises are seeing the potential in the technology both for rapid prototyping and full-scale production. The investment will see the factory increase its capacity to 50 machines allowing them to cater to the automotive, aerospace and other industries. 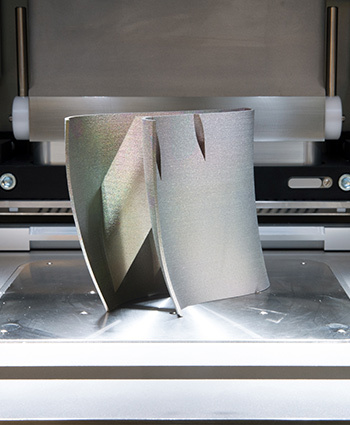 "This significant investment underlines our belief that there is huge potential for innovation and growth within the Additive Manufacturing sector. It is also the next step towards achieving our ambition of pioneering the industrialisation of this exciting new technology and demonstrates how we are leading the way for the fourth industrial revolution." 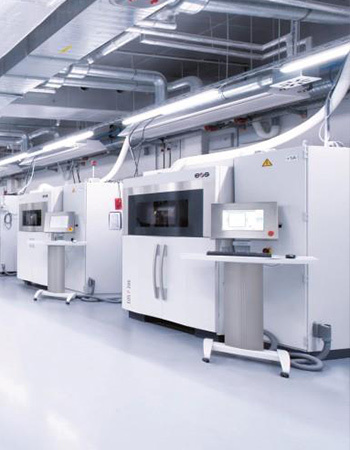 You can read more about Siemen's €30 million investment in their state-of-the-art 3D printing facility. One online manufacturer, Voodoo Manufacturing run a large scale FDM printing factory in Brooklyn, New York. The factory operates 200+ prosumer FDM 3D printers in racks that print orders coming in from their website and commercial product runs. The factory is mostly managed by custom developed software and humans. But in recent years they have been using a robotic arm to automate the process or removing parts from the printers. By utilising a removable build plate and the robotic arm, Voodoo is able to clear completed prints from their printers, load a new build plate and through their software, start a new print job. This reduces the downtime of the machines to a minimum resulting in the higher output at higher speed. 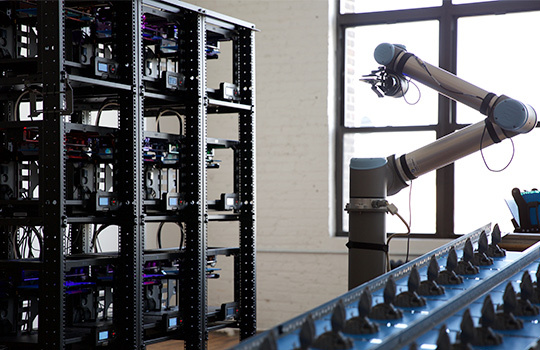 Voodoo is looking to expand the factory further with more robots to manage the gathering of parts from the machines. Like with all automation technologies, there will always be a need for human intervention. Voodoo still have workers removing the pieces from the build plates, cleaning models and preparing the plates for the machines to use. You can read more about Voodoo Manufacturings robotic 3D printing factory over on the Voodoo Manufacturing blog. The future of 3D printing looks very promising with substantial investments in facilities and technologies from large manufacturing brands.